The Beatles 'arrived' when I was nine and nothing would ever be quite the same again. They permeated our young lives and literally became the soundtrack to my adolescence. Christmases were always awash with fabulous Beatle music (1963 With The Beatles, 1964 Beatles For Sale, 1965 Rubber Soul). We thrilled to their sound on transistors, radiograms and TV specials. Years later, Beatles For Sale was the de rigeur LP (and then CD) of choice to be played during the annual decorating of the Christmas tree, and so the Beatles became not just part of my DNA but indelibly part of my daughters' as well... and Revolver remains my favourite album of all time. Today's poem is one that I've just written as part of a project for Blackpool's Imperial Hotel, about some of its most famous guests and this being Christmas week, what better time to give it an airing? 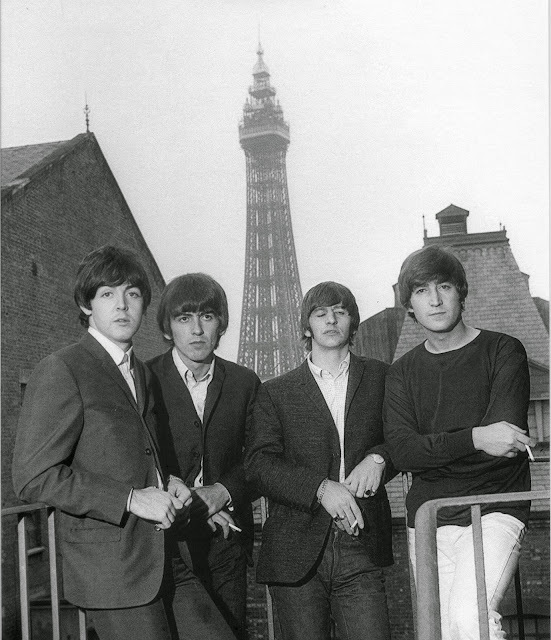 This iconic image of The Beatles in Blackpool was taken on the roof of the Opera House by photographer Peter Emmett. back in the summer of sixty-three. each show a performance to remember. the first of many a Hard Day’s Night. of screaming girls in pheromone flow. figuring the chords to I Feel Fine. they were about to turn on a generation! the Beatles soon commanded every station. eager to escape our post-war blues. in favour of a Magical Mystery Tour. Sad to report, Peter Emmett - the photographer responsible for the shot of The Beatles I used in this blog - has just died in hospital at Blackpool. He was 84. What a great blog and poem. I wish I'd been lucky enough to have been there. I love the Beatles. Yeah. Fabulous band. A most interesting blog and a great poem. Reading this made me quite nostalgic. I've heard many stories about where and when Beatlemania started - so this one sounds believeble and even if its not true I really did the poem. Peace & Love. Love this blog. Society was probably bound to change in the 60s anyway but the Beatles gave it a focus. I envy you for being there when it happened. It was 50 years ago today Sgt Pepper taught the band to play! Great blog. Always loved the Beatles since Ed Sullivan show. Class. Love the Beatles. Love the poem. As others have said, what a Fab blog and poem. Love the Beatles, love Blackpool, love the blog! "screaming girls in pheromone flow"
"allowed us to forgo destination squaresville"
The fab four! Still my favorites 50 years and counting. They changed my world that's for sure. Love your blog and poem. Perennially brilliant Beatles.Your poem rocks! My fried, have you read book Beatles Rocked The Kremlin by Leslie Woodhead? It tells everything everything how Beatles were much loved by Russian youths in soviet time. Fab! Great memories & love your poem man. They were the first band I ever saw - Queens Theatre, Blackpool in August 1963.They were real northern lads and they were ours. Simply the best. Love the poem. Can't believe it will soon be 50 years since it all completely finished. It defies all logic. Were they really from this earth? When you think of all that's been written about the Beatles it's refreshing to find a different and personal angle. Thank you for this. I thought the blog and the poem was great. This brings back some memories! I still love the Beatles. You've written a smashing poem there. Did the Beatles really stay at the Imperial in Blackpool? Simply the greatest group of all time. I love your poem & wish I'd seen them in their hayday. You so lucky living where you do. Top poem. Beatles are my favorites too. You nail it sir. "A cultural phenomenon unparalleled in modern times." A fab tribute to a fab group. They freed our minds for sure. Simply the best: the Beatles and Blackpool. Great days. great memories. Thank you. A fantastic poem. It brings back so many memories. Thank you. Yes. Fab is the word. What a great poem. Saw them at the ABC, Queen's Theatre and also King George's Hall in Blackburn. Amazing memories. Never saw them live. But they have left me a life long legacy to listen to. My biggest regret of the 60's, not seeing them live. I was only 10 in 1963 and couldn't get tickets for later gigs. If I only had a time machine! The 60s started for me when I heard The Beatles first record on a record player in a youth club at Montgomery School in 1962(?). They had split up before I was born but their music was always around even when I was growing up. I think it's best they did their thing and laid it to rest (so to speak) perfect and unspoiled by later embarrassments (ref. e.g. the Stones and Kinks). A great poem and I'm sure you're right. It took a while for the press to catch on and give it a name but that beautiful madness was already gathering pace. John is just the coolest!... like the James Dean of Liverpool!!.. ha! Love your poem. The Beatles = the best. My mum and my aunt saw the Beatles in New Brighton. They are part of my families DNA now as well. My youngest (28) wants the White Album box set for Christmas. I showed him your poem and he said its sound! This was a treat. I love reading about what the Beatles (greatest group in the world) mean to people. Thank you for your excellent poem. Love, love, love. Love your blog & especially the poem. Wish I could have been there when Beatlemania was rife (is that the word?) - but hey, how many generations have they turned on now? 3 at least by my reckoning. Fab poem. Beatles were the coolest. Envy you guys being at the epicenter of such fabulosity. The Beatles sure do it for me still. The Beatles were the soundtrack to my adolescence too - what a great phrase. Your poem perfectly captures the significance of the world's greatest group. I love it, thank you for sharing it. Man, that's a great poem and it captures the impact of the Beatles perfectly for me. Here's a serious question: I've always thought of John as a poet in the way he writes but never felt the same about Paul though I can't put it into words very easily - would you agree and if so why? Bloody hell Steve - your Beatlemania blog still trending 4 years down the line? Testament to the continuing popularity of the greatest group ever...and a fine poem ;-) Clive. The Beatles were simply the best ever. Great memories and a 'fab' poem. Clive Young: yes, the Beatlemania blog comes and goes from the trending list but it has notched up over 20,000 views since I first posted it in December 2014, making it the most read Dead Good Blog by come considerable distance. I thank interest in The Beatles for that, rather than my poem, though I think the latter is quite good and it has just been anthologised. The Beatles is always my favorite band. Now for my children is the same. Thank you for this wonderful poetry. Your poem has all the verve and excitement I associate with that crazy time, perfectly captured. Your blog made me feel quite emotional. I was one of those short-trousered kids in the playgrounds of the early 1960s. We never imagined where all that was going, did we? I mean whoever gives a thought to the Searchers or DC5 these days? As your magical poem tells it, The Beatles really did sweep everything (including us) before them. A genius poem, sir. My parents loved the Beatles and they passed that love on to me. Their music still wraps us round today. That's a really nice blog and a fabulous poem that gets the spirit of those magical days. Love it. Hello Blackpool! Greetings from San Francisco. I love your Beatles blog and poem. It got me digging out my old vinyl of Beatles '65 (Beatles For Sale in the UK). Man was that evocative of wonderful times. Thanks much. I loved reading this, a real buzz. Fabulous. Those were the days! A brilliant Beatlemania poem and an amusing blog. Thank you for sharing this. In retrospect, such innocent times really. I love the poem. When we was fab! Great memories. Thanks. That's a really nice reminder of Beatlemania and why the fab four were so special (and still are). I dig the way you've woven Beatles song titles into the poem. I was on of those "screaming girls in pheromone flow" cited in your amazing poem. I have adored The Beatles since 'Love Me Do' in 1962. I turned 70 last year but sometimes I think I still have a teenage heart. That's my childhood there too Steve. Well captured - the poem is fab!!! I think the poem is great as a vignette of a special time (and place, though I don't know Blackpool) and a remarkable group. If I have to make one criticism, as a stickler for historical accuracy, it's about your reference to "figuring the chords to I Feel Fine" in a hotel room in 1963. Artistic leeway on your part? It is well-documented that Lennon came up with this song in October 1964 during sessions for Beatles For Sale. That's a fantastic poem and a great pic. Pity Ringo had his eyes shut tho'. An amazing poem. I liked the DNA bit in your blog too. My parents met at a Beatles show (Litherland) so the fabs have always been part of our lives as well. What a great tribute to my alltime favorite group. A spine-tingling poem. The magic of the Beatles will never fade. Yes I love this. It's a long time since I went to Blackpool. Would be interesting to go back. As for the Beatles. they are always in my heart. Magical. Number one for always in our hearts. Thanks much for sharing Steve. That is a very lovely poem. Bravo Steve :) Thank you. You so lucky to be live in England. I lovely poem. The Beatles brought us so much joy. Your fabulous poem captures that spirit. A splendid time was guaranteed for all (Sgt. Pepper). Just love that line "awash with fabulous Beatles music". Exactly how it felt way back then. My favorite LP has always been Beatles '65, good though Rubber Soul, Revolver and Pepper were. Thank you for your poem. They are enthralling us still. That is a fine poem sir! A celebration of more innocent times. Oh nostalgia!!! What a lovely tribute to the Fabbest Four. Well done. Delightful blog & poem Steve Rowland. Thank you for sharing. Peace & love. "In my life I've loved them all." Truely. Wish I'd of been there. I am beatlesmaniac. Love love love.